“There’s been more people hurt by roller coasters in the last 10 years than there has been by elephants. Nobody wants to ban roller coasters,” says Minneapolis police Sgt. Timothy Davison. He may not be an expert on roller coasters, but does know a thing or two about elephants. Before he became a cop, Davison was an elephant trainer and caregiver. Davison worked regularly with the Shrine Circus and disputes the contention by activists who charge that circus animals are routinely mistreated. It's a classic subject-verb disagreement problem. "There's" is a contraction of "there is." "Is" is a singular verb. People...yes, that would be plural. "There've" looks weird. We're not sure it's really a word. But "there's" isn't correct, here. Far be it from us to cast judgment on elephant trainers turned lawmen, but we'd like to think someone who's sworn a vow to serve and protect includes Mother Grammar among his constituents. 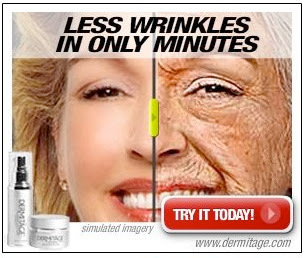 It's fewer wrinkles, people. FEWER. We'd settle for less wrinkly, though. Here, and in real life. "I loved school, loved UCLA," Abdul-Jabbar says. "I remember, in an English class taught by a Mr. Lindstrom, we were asked to do essays and he said he would read the best three to the entire class. He read the first two, then said he was going to read the best one, and it was mine. "It was right then that I thought maybe I could do this, that maybe I had what it takes. "He also played at UCLA for John Wooden, always more English teacher than coach. "We'd sit on the bus and talk about when to use a colon and when a semicolon," Abdul-Jabbar says. "We'd argue the difference between "like" and "as if." Though this blog is listed as participating in the event, I feel a tremor of apprehension at how the various mavens, snobs, SNOOTs, elitists, prescriptionists and precisionists, drunk with power at getting a day all their own, might comport themselves. Mr. McIntyre gives us a great idea: to list the things that will NOT happen on National Grammar Day. For starters, we will not use stockades. Those aren't terribly portable, and worse--in Restoration London, they were sometimes covered in bits of ears that had once been nailed to the boards. It would defeat the purpose of the day if participants lost their ears. How would they ever hear correct grammar again? If you have ideas for other events that will not occur, please send them to info@spogg.org. The Lasting Influence of Nirvana? If you're a sushi eater, then the New York Times story about mercury-tainted tuna might have given you a bit of indigestion. Besides being a Nirvana album, "nevermind" is a regionalism that essentially means "attention." E.g., "Pay no nevermind to the blogma you read online...those people all think the same." The rest of us write "never mind" as two words. sentences: “Recautionment is the parent’s permanent charge. Children learn to recognize and avoid danger only with repetition.” I can imagine the federal government devising a Department of Recautionment, which could encompass so many of the current departments that attempt to protect us: the FDA, the TSA, the HSA, the FBI, the ATF, even DoD. Yet the DoR would protect us from all dangers: those we create ourselves and those created by others and even by forces outside of human control. I’ll sleep well tonight knowing that recautionment is on people’s minds. We decline on principle to participate in Facebook challenges with hideous grammar errors in them. So there! Barry L. caught this great example of a nasty bit of verbing in today's New York Times (though it's an Associated Press piece). "Police Use Tear Gas On Zimbabwe Opposition" isn't THAT much longer. But we certainly "gas" people, as a verb, so maybe "Police Tear-Gas Zimbabwe Opposition"
Barry's right. The hyphen does make this better. It's a bad headline not just because of the missing hyphen, though. "Tear" has two meanings (and two pronunciations). There's "tear," as in the thing that leaks from your eye. And there's "tear," which is what you do to your garments when you see a really terrible (or tearable) headline. A reader coming to the story cold doesn't know which one this is, and could spend quite a bit of mental energy translating the headline. It's true that newspaper headlines often have to be short. This one should have been rewritten to avoid that ambiguity. Mumbai: An English teacher from Mumbai has been awarded a Guinness Book of World Records' certificate for the Longest Grammar Teaching in the world when he taught grammar to the students continuously for 73 hours and 37 minutes. Sanjay Kumar Sinha, known as 'Gramathon man', received the certificate last week for this feat, which he performed on October 20, 2005. A total of 59 students participated at the Bay City Club, Bandra for a continuous period of 73 hours and 37 minutes. Along with him, the students who participated in the venture also got certificates for learning the subject for the longest lesson learnt. "I got the certificate only last week. This is because there were 65000 claims to be assessed by the Guinness, and it takes a long time to get the final inclusion and a place into the Guinness," Sinha told PTI. When he conducted the Gramathon a total of 72 students participated. However out of them 13 students were disqualified on the grounds of health, as keeping awake for 73 hours was not easy. Their blood pressure and other health parameters were not satisfactory during the event. There was only 10 minutes break after eight hours of gruelling session. There was no break for lunch or dinner. All the participants could only consume light food while they were learning. Still, what if we staged a National Grammar Day event with the most simultaneous lessons in grammar? Would there be a record in that? Apparently it is very difficult for celebrities to speak grammatically once they have conceived and/or borne children. Christina Aguilera's people issued a news release last week with an I/me error. Matthew McConaughey did the same thing earlier this week. We're all for evolution here at SPOGG, even if we oppose letting language evolve so much that "I" and "me" become interchangeable. They also reflect on President Bush's decision to offer "smart" bombs to Saudi Arabia and congratulate the children's book authors who won the 2008 Caldecott and Newbery Awards. So, when these bombs explode, does everyone sit down and read? That would be nice, especially if the book bombs were immediately followed by grape-juice and carpet-square bombs. But we don't think that's what the writer meant. A comma would have made this sentence much clearer. They also reflect on President Bush's decision to offer "smart" bombs to Saudi Arabia, and they congratulate the children's book authors who won the 2008 Caldecott and Newbery Awards. It was not that her husband no longer loved her, she said he told her; he just did not find the relationship exciting anymore. It was not that her husband no longer loved her; she said he told her he just did not find the relationship exciting anymore. It was not that her husband no longer loved her; he just did not find the relationship exciting anymore. We're half expecting that sentence to fold itself into a red Porsche convertible and drive around town with a 23-year-old trophy girlfriend. A midsentence crisis—there's nothing sadder. And everyone knows you're bald under that baseball cap. For Jordan and ME. Would she say Saturday was a very special day for I? Probably not (though one never knows, with pop singers). When in doubt whether you should use "me" or "I," drop the other person from the sentence. You'll know right away. The gracious Richard Nordquist has written a lovely bit about our upcoming celebration, National Grammar Day, on his About.com blog. Do you have ideas for how we can honor the mother tongue this March 4th (which happens to be the only day of the year that doubles as an imperative)? If so, please send them in! Verbs Gone Wild: Are We Taking Too Many Liberties with Language? Newspaper reporters are taught to shun the serial comma. So, in a sequence of three things--apples, oranges and pears--the newspaper reporter would NOT put a comma in front of the and (even though someone writing a book would). The matter is not simply that his writers were on the picket line on a primary eve that saw both a formerly fat former governor of Arkansas introduce a sandwich called the Huckaburger and Mike Gravel, the presently zany former governor of Alaska, advise an audience at Phillips Exeter Academy to smoke marijuana, as if boarding-school students needed such encouragement. The sandwich is called "the Huckaburger." It's not "the Huckaburger and Mike Gravel," even though that's how anyone not from a town called Hope would read it. When a sentence sprouts a complete second half, you need to insert a comma before the conjunction. Sometimes, when you have two complete sentences joined by a conjunction, you can drop the conjunction and insert a semicolon, but not in this particular example, or on Slate in general because its former editor, Michael Kinsley, hates semicolons. That's awfully rich for a guy who was still wearing handsome little gold-rimmed spectacles in the 1990s. A headline on Slate misspells the Latin expression ad nauseam. If one must misspell a pompous Latinism, we rather like this version. It calls to mind museum, and what would be more...interesting than a museum of nauseam? We're stepping now into the projectile wing; please put on your protective eyewear. Spelling his own name correctly? 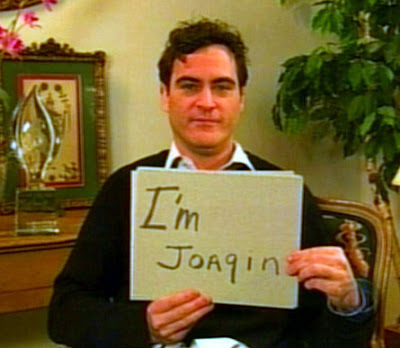 Unless this is some sort of subtle Iraq war reference that we just don't get, it's Joaquin. With a u in it. And this, my friends, is probably the saddest thing we've seen all week, even if we wouldn't mind being the sassy June Carter to his strung-out Johnny Cash. We proofread Joaquin! Call us! Woo hoo!! 2008, Happy New Year everybody, it's going to be a good one. Myself and all the Spiceys had a great Christmas. We caught up with our families, ate lots of mince pies and got some well-needed sleep! If you happen to notice a co-workers zipper is down (highly un-professional, but it can happen to any of us) do you discretely let them know so they can save face; or do you go for the juggler & tell everybody in the board room how un-reputable they are as a manager or layer based on a rather simple error. Sigh. Where to begin? Some errors are easy. Co-worker's (or colleague's) needs an apostrophe and no hyphen. Unprofessional doesn't need a hyphen, either. Also, is it unprofessional to have a fallen zipper, or is it unprofessional to be looking at a colleague's bathing-suit zone? Discreetly has two e's in this context. It means tactfully or subtly. Discrete with one e means completely separate or unconnected--chances are if you went that route, your colleage wouldn't hear you. Unless many coworkers are running around with open barn doors, you have to say "him or her" to keep your subject and object parallel. Go ahead and write out the whole "and." Ampersands should be used with company names, some academic references, when space is limited, or in artsy-fartsy logos. Un-reputable is not a word. Disreputable is. And for the sake of clowns, leave the juggler alone. Go for the jugular--if you must.